Nearly 50 current and former Jefferson Lab employees were recognized on Sept. 29, 2016, for inventions they created while carrying out their work at the lab – unique innovations that resulted in 39 patents – awarded between 2011 and 2014. 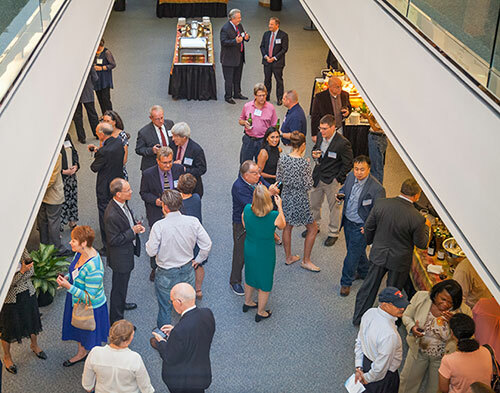 The event began with a reception in the CEBAF Center lobby, followed by the presentation of patent certificates. Nearly 50 current and former Jefferson Lab employees were recognized on Sept. 29, 2016, for inventions they created while carrying out their work at the lab – unique innovations that resulted in 39 patents. On hand to applaud their efforts were SURA President and CEO, Jerry Draayer; PAE Chief Operating Officer, Karl Williams; Lab Director Hugh Montgomery and other members of lab leadership. Draayer and Williams are vice chairs of the JSA Board of Directors. In opening remarks, Draayer congratulated the patent recipients for their successes, and emphasized the importance of pursuing patents as an essential part of the lab’s ongoing technology transfer program. Draayer was followed by Williams. “Receiving a patent is tough. When you think about a patent it is all about creating something that is unique, something different, something lasting. It also shows our customer that we are innovative and creating new value for JSA and for DOE (the Department of Energy).” Williams commented. Next to take the podium was guest speaker Zack Miller, a notable Tidewater-area entrepreneur, who founded a regionally acclaimed business incubator called Hatch. He commended the inventors on the hard-earned achievement of receiving a patent, and said how inspiring it was to be with the group. “I’ve invested in 13 companies and have applied for one patent – and am still waiting to hear the outcome,” he quipped. The patents, which were awarded between 2011 and 2014, cover a wide range of innovations and advancements in accelerator and particle detector technologies and instrumentation. Jefferson Science Associates (JSA), the management and operations contractor for Jefferson Lab, owns the patents. JSA encourages lab staff to apply for patents on novel ideas through the lab’s Technology Transfer Office. To recognize the development of new technology and advancements, JSA awards $500 per patent, and shares royalties, after administrative expenses, evenly between the lab and the inventors. Depending on the number of patent applications awaiting review at the U.S. Patent and Trademark Office (USPTO), obtaining a patent can take 1-2 years, according to Weisenberger. After an invention disclosure is sent to the JSA patent attorney, an application is drafted by the attorney and reviewed by the inventor(s). When all necessary parties are satisfied with the application, it is filed with the USPTO. The patent attorney coordinates with the Jefferson Lab counsel and responds to any official actions by the USPTO. The potential value is not only to JSA and Jefferson Lab programs, but also to private industry and high-tech startups through technology transfer. Any established company or start-up business may submit a proposal to obtain a license of rights from JSA to use, manufacture or sell a JSA invention, copyrighted material or patent. *Included in this list are a handful of inventor/innovation collaborators from outside the lab who are co-inventors on patents. This list includes only patents awarded during calendar years 2011 through 2014. Patents awarded beginning in calendar year 2015 and later will be recognized in the future.